Kudos to Nicole Kidman’s plastic surgeon! What a job on her already perfect head! We are more than happy to pile derision on the stars and surgeons who botch their head jobs, but no one commends those stars and surgeons who produce dynamite results. In THE INVASION, yet another remake of INVASION OF THE BODY SNATCHERS, Nicole Kidman is psychiatrist Carol Bennell – and my God! She looks 23! She must be pushing at least 70 by now! Our hats off to Dr. Plastic Fantastic! And to the designer bra that keeps her an upright D when we know she’s only pushing Bs. Or has Dr. Fantastic dipped his scalpel in that chest cavity as well? Consequently, being the star of a thriller where she is required to constantly run from danger, devolves into an exercise in prurience, as the male of the species tumescently gawks at that sweater one size too small for her straining D-bra and secretariat skirt tight enough to notice No Visible Pantyline on that whipcord body. No, it’s not distracting from the story at all. Why is she running? Who cares? As long as you keep wearing those tight clothes, honey! Let’s see, who directed this? Oliver Hirschbiegel – oh, it’s a guy. Surprise, surprise! Why would a guy make Nicole Kidman run around in tight clothes for 90% of the film? Beats me. From Jack Finney’s original novel The Body Snatchers, screenwriter David Kajganich has modernized the threat to not just “alien spores” but alien DNA cells brought to Earth by a crash-landed Shuttle, attaching to our DNA and absorbing our personalities, making the human race homogenized, emotionless catatonics. The one quest of those who have been overtaken by the alien DNA is to seek out those who haven’t been, and infect them by spitting on them or loogying in their iced tea. Daniel Craig is Nicole’s love interest, and I don’t know why the filmmakers chose to emasculate him into a Just Friend; it serves no purpose keeping him blue-balled. Jeremy Northam is the ex-husband, Jackson Bond is the immune son. Veronica Cartwright, who moaned her way through the 1978 INVASION, moans her way through this one. Jeffrey Wright is magnificent as a scientist who discovers the purpose of the alien cells and the cure; so natural, so underplaying, why isn’t this guy a bigger star, at the least, noted for his incredible supporting performances? If MIGHTY JOE YOUNG was the KING KONG remake-with-a-happy-ending, then THE INVASION does the same thing for INVASION OF THE BODY SNATCHERS. Whereas the 1978 version ended on a terrifying note for the human race, THE INVASION, after the perfunctory chase scenes and plot twists, peters out to a Disneyfied ending that even allows Daniel Craig out of the Friend Zone. 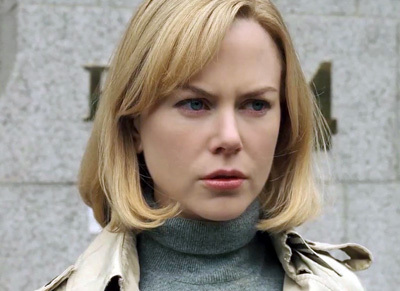 How can I be expected to wrap my emotions around the supposed tension of this tale when all I can think about is, ironically, snatching Nicole Kidman’s body? aka: INVASION OF THE BODY SNATCHERS 2007. Directors: Oliver Hirschbiegel, James McTeigue. Writers: David Kajganich, Jack Finney. Starring: Nicole Kidman, Daniel Craig, Jeremy Northam, Jackson Bond, Jeffrey Wright, Veronica Cartwright, Josef Sommer, Celia Weston, Roger Rees.